For the avocado nuggets, combine the panko crumbs and 45g pecorino. Season to taste. Cut each avocado into quarters and then into quarters again so you end up with 16 wedges. Dip each wedge into the beaten eggs and then into the crumbs. Dip them back into the eggs and into the crumbs again. Heat the oil in a deep-fryer or deep pot to 180°C. Fry the wedges off until crunchy and golden, 2 – 3 minutes. Drain on paper towel and season with a little salt. Allow to cool for 5 minutes. For the dip, place everything in a food processor and purée until smooth. 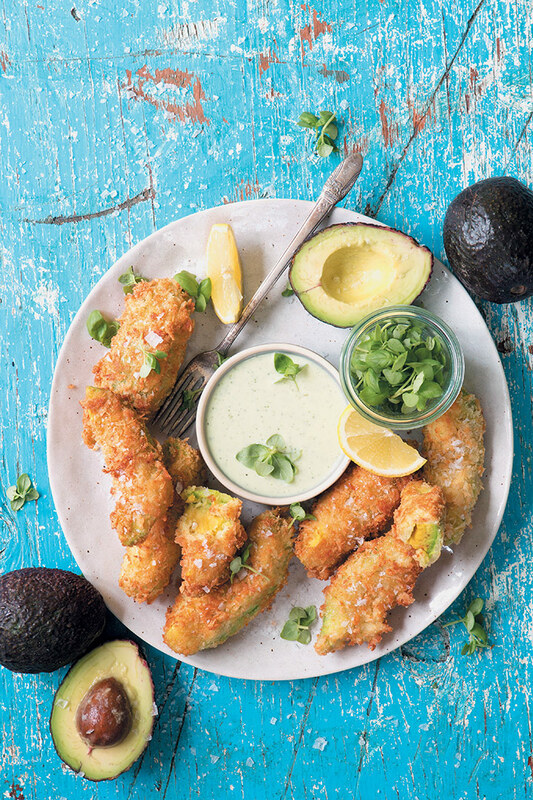 Season to taste and serve with the avocado nuggets. Add the lemon wedges on the side for squeezing and garnish with microherbs, if desired.